Here is good news for teaching aspirants looking permanent post in Delhi. 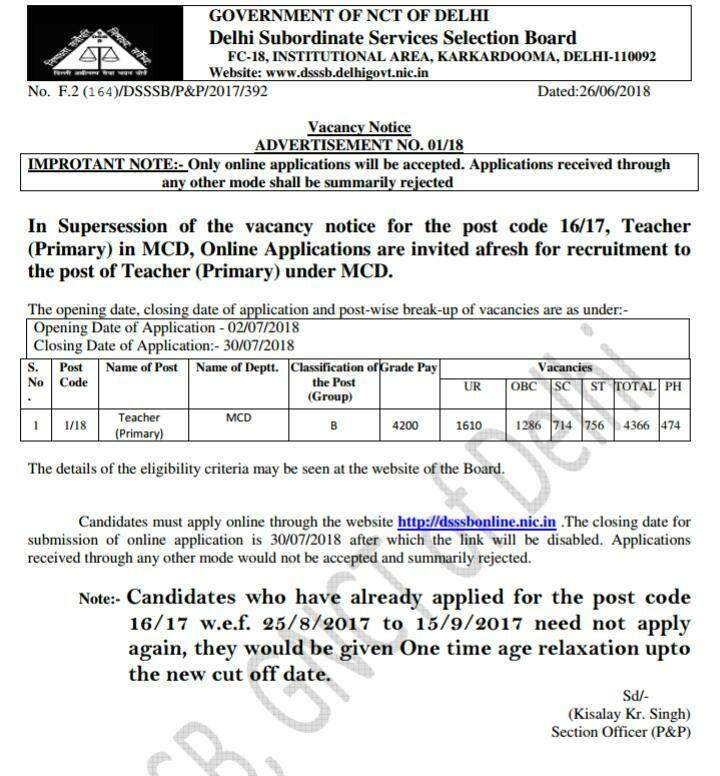 Dsssb issued revised notification for 4366 primary teachers vacancy in MCD. Actually Delhi primary teacher recruitment 2018 was published in 2017 but due to some reason couldn’t processed. Now fresh notification arrived, but need not to apply those candidates who already apply in 2017. Age limits 30 years, 5 year relaxation to mcd contract teachers and others as per Delhi Nct rules. Read below deatail. the post of Teacher (Primary) under MCD. Nursery or primary teacher to TGT teachers promotional criteria in delhi nct. Total number of vacancy is 4366 in MCD schools. Category-wise deatails check here. the new cut off date. Opening Date of Application – 02/07/2018. Closing Date of Application:- 30/07/2018. Pay scale for Delhi primary teacher recruitment 2018 is 9300 plus 4200 grade pay. Acording to 7th pay Commission matrix. Basic would be near by 47000 rupees. So total in hand salary minimum 50000 rupees. a) Women candidates and candidates belonging to Schedule Caste, Schedule Tribe, Physically Handicapped & Ex-serviceman category are exempted from paying Application fee. The selection shall be made through One Tier examination scheme. 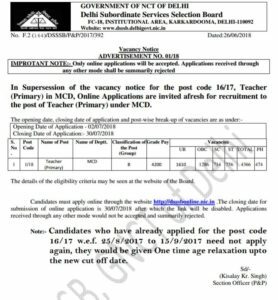 Delhi primary teacher recruitment 2018 based on Written examination of 200 marks. In examination 200 multiple type questions would be asked. Exam pattern is giver below. Its a single Tier examination. This exam has two section. A. NON TEACHING of 100 marks, it has 5 sections. 5. Test of English Language & Comprehension. B. TEACHING related 100 questions. Section- B:- MCQs of one mark each from the subject concerned (teaching methodology/ B.El.Ed./ D.Ed./ NTT/ JBT etc. )- (100Marks). Go on DSSSB official site http://dsssbonline.nic.in and apply carefully after reading complete details.